Stan Laurel and pooch in 'A Dog's Life'. 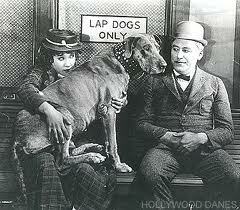 Keystone Teddy, aka Teddy the Wonder Dog featured in several Mack Sennett comedies (Sennett on right). 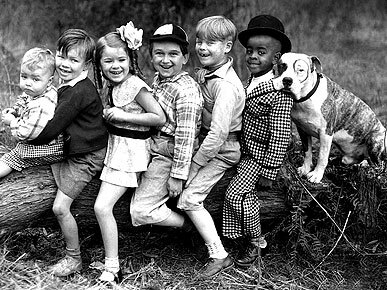 Petey the pit bull was one of the stars of the "Our Gang' comedies. 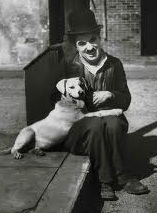 Chaplin and Scraps the dog waiting for their scene in 'A Dog's Life'. Pepper the cat, feline star of the silents. One of the best things about The Artist is Jack, played by Uggy the dog. Possessing great comic timing and abundant charm, the small dog shamelessly steals scene after scene. Michel Hazanavicius in fact used a key feature of silent comedies, which from almost the beginning used animals to add a cuteness factor to their movies. Dogs were the most popular, probably because they are more amenable to training and direction. Cats, which scorn this quality, consequently appear less frequently.However, one of the earliest animal co-stars was a feline called Pepper, who occasionally 'acted' alongside 'Teddy the Wonder dog. Teddy became a staple of Mack Sennett comedies, stealing scenes from the likes of rising stars Gloria Swanson and Wallace Beery.Other dogs later followed Teddy's rise to stardom, including Cameo, Strongheart and later, and most famously, Rin Tin Tin and Lassie (although both were actually a series of animals, not one). • The plot Singin' in the Rain is based on the introduction of sound into Hollywood movie-making in the late 1920s, and the reactions of stars, producers and directors to this new technology. 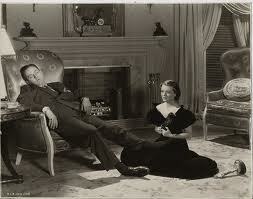 The Artist similarly relies for its plot on this innovation and the various responses of cast and crew. • The Artist uses the earlier film's essential device of a love story between a male star whose career declines with the rise of talkies and a young unknown female extra who become a star. As in Rain, the film's happy ending sees both actors united and successful. • Hazanavicius' movie copies Singin' in the Rain 's motif of a silent movie star who is blinded by ego and pride, unwilling to adapt to the new demands of talkies.However, by the end The Artist's hero uses his dancing skills to make the transition to sound, while Rain's falling star, Lina Lamont's career is doomed. • The 1952 Kelly-Donen movie has a film-within-a-film sequence, the silent The Dueling Cavalier which is amusingly turned into a talkie musical, The Dancing Cavalier. 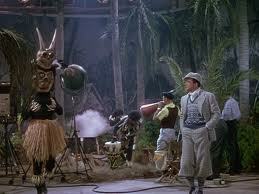 The Artist has two silent movie sequences within its structure: a Fairbanks style pastiche and a jungle movie. • Of course, there are some major differences between the two movies. The Artist appears in an approximation of black and white film stock,while Singin' in the Rain is in colour. The latter uses sound, the Hazanavicius movie is virtually dialogue-free. Kelly-Donen's movie is above all a musical with some of the greatest and most inspired dance sequences in cinematic history, whereas The Artist has only a couple of enjoyable but straightforward musical/dance routines. 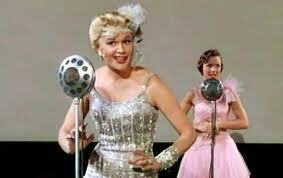 Microphones and sound are constant motifs throughout 'Singin' in the Rain', as befits the plot's focus on the transition from silents to sound in the movie industry of the late 1920s. Much of the humour of Singin' in the Rain' derives from the movie-makers' frantic attempts to adapt to the new technology of sound. 'Singin' in the Rain: the film within the film. In the 1937 William Wellman movie 'A Star is Born', one of the top stars of the era, Janet Gaynor,herself once a struggling actor who hit the big time, played Vicki Lester, an extra who becomes a star. Gaynor had made her reputation in the twenties in silent movies, but she was lucky in that her voice proved appealing and so she made the shift from silent star to sound star. Ironically, the 1937 movie marked a comeback in popularity for Gaynor, whose career had been in slow decline in recent years. Wellman's movie focuses on a declining male star (Frederic March) sinking into alcoholism and despair, who helps an unknown actress. Her career takes off and the pair marry, but his professional and personal decline continues -closely resembling the fate of the silent star John Barrymore, whose acting style is referenced in The Artist. 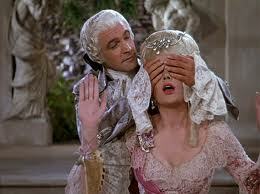 George Cukor directed this highly regarded remake. Cukor and scriptwriter Moss Hart kept the basic plot, while shrewdly toning down the abrupt rise to stardom of the female lead. And the setting is subtly altered to take advantage of Judy Garland's singing skills.Esther Blodgett, as played by Garland, is already working professionally as singer-dancer before she finds fame in Hollywood. 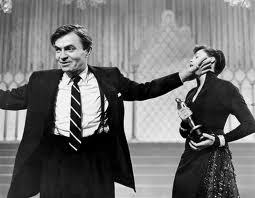 Her husband, brilliantly played by James Mason, career declines as hers rises and he increasingly turns to drink. The excerpt below shows just hpw cleverly integrated are the musical and dramatic elements of the movie's rise-and-fall theme, a feature absent from the 1976 version. This Barbra Streisand vanity project, directed by Frank Pierson, shifts its focus from Hollywood to the music business. Streisand plays a (young? ), ambitious singer-songwriter who teams up with a famous singer-songwriter (Kris Kristofferson). One career rises, the other declines into self-destruction. 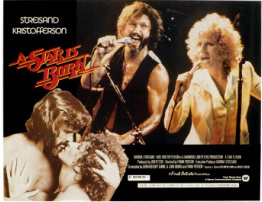 In fact, the film did in effect destroy Kristofferson's movie career, although it was a big box office success. Today it is relevant only as a display of seventies-era musical super-star ego and posturing. 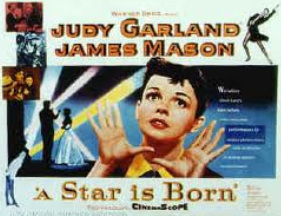 The film within a film motif is used in the March-Gaynor movie , and was copied in 'Singin' in the Rain' and 'The Artist'. The only enjoyable aspect of this atrocious remake is the remarkable consistency of the movie's bad acting and ludicrous dialogue.